Discussion in 'TASCAM DM-24' started by YellowDissident, Mar 1, 2015. Just this mornig, I tried to turn on the Dm24, but I only get an black iluminated screen. I tried to reset the desk holding keys 2nd f +High+ -library key while I power on the desk, but I cannot access. Diagnostic Mode...The screen doesnt show any info or letters Any help?? Try to check the PSU voltages. I have the same problem. All the voltage are correct. Is there more technical information the DM-24? I have allready the Service manual. It seems like the CPU does not start. Is it good that I have a -29 volts on the board of the power supply? Howard L. Salter likes this. When I switch on the DM-24, the screenlighting is working. But no information on the screen (unit looked likes dead). It seems like that the CPU is not starting. All the connections on the first power suplly (the problem child one..) are oke. I checked all of them with myn oscillopsope. I have the Service manual, but its gives no information about the hight of the voltages on the second power supply. Where can I found it? Is there somebody with more informatie about this problem? I went into similar problem two or three times. New eeproms had solved the problem. Are all capacitors visual in good shape? No leaking? If the Eproms are simply corrupted but not totally dead, this procedure allows you to reprogram them by downloading new firmware over midi. "How to reprogram eproms that have totally corrupted." "Hold down these three buttons: "2nd F." + "EQ Hi Mid" + "Library +" and then power on the DM-24. your DM-24's OS using the latest OS MIDI files. Symptoms on Power On: White Screen, All Faders merely move 1/8" in a bump rather than the full length of the slide, the lights on the bottom. Going to open it up on a bench and test the power supply. 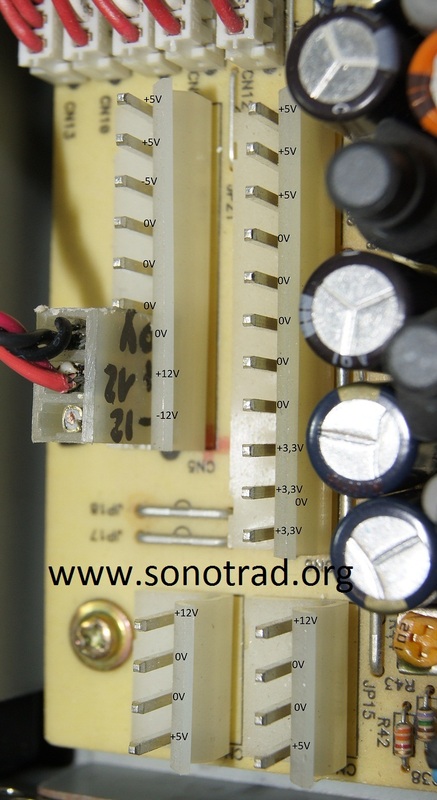 The right voltage will drop if a capacitor is partly working but not complete when put under load. Fault searching should be done by first removing and replacing big caps in the power supply. Look at the picture Berl put up. Look for bulging tops on the caps,and also look at the inductor- that thing that looks like donut wrapped with wire standing on end in the middle of the power supply PCB. The wires should be red and orange. If they are black,the inductor in fried and the power supply would be almost impossible to repair. Someone was retrofitting PC power supplies in the past,there might be some docs online. If the power supply is good,you can try re-seating the EEPROMS. The tops slide off,you have to put pressure on the plastic piece on the top and slide to release the EEPROM keeper. DON'T PRY ON THE TOP WITH A SCREWDRIVER,YOU WILL RUIN THE PROM SOCKET AND DAMAGE THE MAIN PCB. The socket can be cleaned with a little alcohol and q-tips. Make sure the PROMS are oriented properly before reinstalling the keepers. If you don't know how to do what I have told you-find someone who does. Grandpa sez "common sense ain't that common"